Late Soldier Leaves Journal To Infant Son Journalist Dana Canedy's life and family was changed forever when 1st Sgt. Charles Monroe King, the man she loved, was killed in combat after a roadside bomb, ripped through his Humvee in Iraq. Before his death, King wrote a journal to their infant son, Jordan, whom he had seen once. The ongoing wars in Afghanistan and Iraq have torn apart thousands of families for months and years at a time. 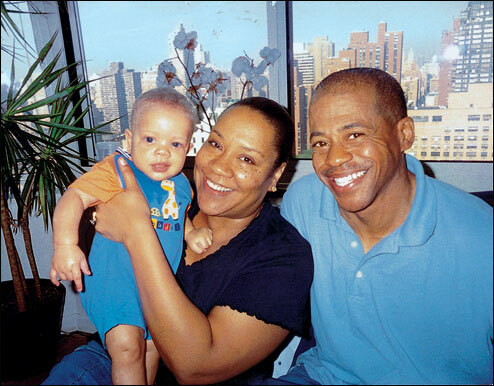 But journalist Dana Canedy's life and family was changed forever when 1st Sgt. Charles Monroe King, the man she loved, was killed in combat after a roadside bomb, ripped through his Humvee in Iraq. 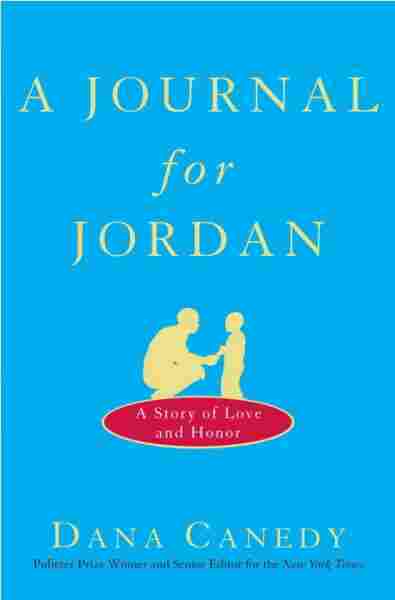 Before his death, King wrote a journal to their infant son, Jordan, whom he had seen once..
Canedy talks about her recent book, A Journal for Jordan: A story of Love and Honor, which includes notes from the late soldier to his son. Dana Canedy (center), the late 1st Sgt. Charles Monroe King and their infant son Jordan share a family photo. If you are reading this book, it means that we got through the sorrowful years, somehow, and that you are old enough to understand all that I am about to tell you. You are just ten months old now, but I am writing this for the young man you will be. By then, you will know that your father was a highly decorated soldier who was killed in combat in October 2006, when a bomb exploded beneath his armored vehicle in Iraq. You were six months old. You will know that he left a journal for you, more than two hundred pages long, which he handwrote in neat block letters in that hot, terrifying place. What I want to tell you is how the journal came to be and what it leaves unsaid about your father and our abiding love. Before he kissed my swollen stomach and left for the war in December 2005, your father, U.S. Army First Sergeant Charles Monroe King, had been preparing for the promise of your new life and for the possible end of his own. Even before he boarded that plane headed for danger, I worried that he would be killed. So I gave him a journal. I hoped he would write a few messages, perhaps some words of encouragement to you, though you were not yet born, in case he died before you knew each other. We did a lot to prepare for the possibility that your father would miss out on your life, including finding out if you were a boy or a girl before he left; he was thrilled to have an image of you in his mind and kept your sonogram pictures in a pocket in his uniform the whole time he was in Iraq. And then there was the journal. Writing it would be a way for your dad to help guide you through life if he did not make it home to us. He wanted you to know to pick up the check on a date, to take plenty of pictures on vacations, to have a strong work ethic, and to pay your bills on time. He wanted to tell you how to deal with disappointment, to understand the difference between love and lust, to remember to get on your knees and pray every day. Most of all, he wanted you to know how much he loved us. Be humble about your accomplishments, work harder than the man next to you, it is all right for boys to cry. Sometimes crying can release a lot of pain and stress. Never be ashamed to cry. It has nothing to do with your manhood. Your father mailed the journal to me in July 2006, shortly after one of his young soldiers was killed in an explosion eerily similar to the one that would claim his own life. He was so shaken after pulling the young man's body, piece by piece, out of a bombed tank that he sent the journal to me, unfinished. He had more to say, but that would have to wait until he came home on a two-week leave to meet you, six weeks before he died. I read the journal in the calm of night on the day it arrived, with you sleeping next to me, and fell in love with my gentle warrior all over again. He was the most honorable man I have ever known, and the most complex. I do not want to portray your dad as a saint whose example you could never live up to. He was not. He was gentle, benevolent, and loyal, but he could also be moody, stubborn, and withholding. He would brood for days over a perceived slight, like the time I spent my birthday with my sisters and girlfriends instead of with him. He put his military service ahead of his family. I also want you to understand me — an imperfect woman who deeply loved her man but struggled during our long courtship to accept him as he was. We were together for the better part of a decade, half of which he spent waiting for me to fall in love with him. Truth be told, every girl has an image of the man with whom she will walk down the aisle one day, and he was not the groom I had imagined. He was excruciatingly introverted, a procrastinator, and got his news, God forgive him, from television instead of the New York Times, where I have worked as a journalist for more than eleven years. I am loquacious, assertive, and impatient, which mostly amused your father but sometimes annoyed him. I am also obstinate and impulsive. My weight fluctuates when I am stressed. I curse in traffic. I had a demanding career as a reporter when I met your father, while he was away for months at a time in the wilderness, training young men for battle. A former drill sergeant, he had a strong sense of duty. He was so devoted to his troops, many just out of high school, that he bailed them out of jail, taught them to balance their checkbooks, and even advised them about birth control. I learned to live with his long silences and ambivalence toward newspapers. But I struggled to understand what motivated the man who had for so long dreamed of your birth but chose to miss it because he believed his soldiers needed him more. He refused to take his leave from Iraq until all 105 of his men had gone home first. Enlisting in the army was one of the best decisions I had ever made in my life. God blessed me above all I could imagine. Like anything, you have some challenging days, but when I look back I have no regrets. The army even recognized my artistic abilities. I also met a lot of great people. It's been an awesome experience. Thanks, God. But those were peacetime experiences. The military had also introduced Charles to killing and death. The sight of blood gave him flashbacks. Chemical sprays he received during the First Gulf War left permanent splotches on his arms. For years he was haunted by images of combat, unable to speak about them even to me. During his final tour of duty, he experienced loss of the worst kind. His goal was to bring every one of his men home alive; he even made that promise to many of their wives. It was a vow he could not keep. Still, he never questioned the rightness of a single mission. For Charles, the war was not about "weapons of mass destruction" or an "axis of evil"; I never heard him speak those words. It was about leading the soldiers he had trained by example, about honor and dignity, and about protecting a country he loved from enemies real or imagined. I am proud of your dad's honor and dignity — even of the way he died. Son, all of us will leave this world, but so few die a hero's death. Still, the would-be wife and new mother in me are angry at times that he left us so early, at the age of forty- eight. Was it heroic or foolish that he volunteered for the mission that killed him? As the daughter of an army veteran, I grew up on or near military bases and after I left for college wanted no more of that life. So for years I resisted getting deeply involved with your father, and much of our long-distance romance involved him chasing me and me pushing him away. We dated other people at times, me out of a fear of committing to your father, him out of frustration with my dithering. Ultimately, it was his steadiness, his character, and his sureness about who he was and what he stood for that won me over, something you will get to know by reading the journal. Listen to your first thought. You will figure this out on your own. Never second-guess yourself. When your heart is in the right place, always go with your first thought. Work hard at things and follow your instinct. Since you were born, you have always been alert. That means you will be very perceptive about things. Believe God and trust yourself. Keep the faith, Jordan. You will be fine. Your dad wanted so badly for you to know him that he revealed himself in the journal in a way he rarely did in person. He told you things about himself that I never knew. He wrote that he wanted to see the Great Wall of China and to take guitar lessons. He went into detail about his love of art, his religious faith, and his childhood in Cleveland. I laughed as I pictured my soldier wearing stack-heeled shoes and bell- bottom pants in junior high school. My favorite stack- heeled shoes were bought from a shoe store called Thom McCann. They were black patent leather with a suede heel. Now Grandma King would always say stack- heeled shoes were no good for your back. I guess I had to learn the hard way. I was walking downtown and glanced over at my reflection in a department store window. I was walking hunched like an old man. I had to throw them away. Cleveland Browns fan, and had his first kiss in the eighth grade with a girl named Denise. I walked her home after school and she thanked me by giving me a kiss. I was a little taken back by it. Being in the eighth grade, it was a big step for me. All the girls were always smiling at me and joking around. I remember buying a brand-new baseball jacket. I took it to school and let all the girls sign it and put their phone numbers on it. I had the jacket in my room and Grandma King grabbed it thinking it was dirty and washed it. I rushed home from school, anxious to read my jacket, when I saw Grandma King hanging up my clean jacket. Grandma laughed. I was on my knees crying. Your dad was an extraordinarily disciplined man. He believed that sweating on a five- mile run was the best way to shake a cold. He picked the skin off chicken, would not drink more than one or two beers in a night, and did not allow himself to binge on the pastries he loved because he so closely watched his diet. Despite his regimented manner, there was so much depth to your father's character. He had a mind for war strategy but drew angels bowed in prayer. He spent hours sculpting a taut body, even starting his days in Iraq in a gym at 5 a.m., but he loved my morethan-ample curves and had the softest skin I have ever touched. He gave away copies of his art to soldiers he respected but would shout his throat raw when they made mistakes in training that could cost them their lives in combat. "When he yelled, you moved," one of the officers he served with said in a eulogy at his funeral. "Because he only yelled when there was good reason." This tough guy was the same man who liked to feed me champagne, popcorn, and chocolate in bed. The man who loved you so dearly that during the two weeks he had with you that August — the only two weeks — he barely slept. He preferred to spend that too brief time dancing around with you in his arms, taking you to the bookstore for story time, and simply watching you sleep. He rarely discussed his personal life at work, but after he died his soldiers said that they knew that when he was "working" in his office, he was often gazing at pictures of us. His imposing presence was really a mask for his shyness. Simple things brought him pleasure: drawing pictures of me, starting the day in prayer, summer rainstorms. Sometimes you get lucky and catch a rainbow. I never knew the fierce warrior who led those troops, and I was sometimes a mystery to him, too. He thought I talked things to death. He read my newspaper stories if I asked him to, but he had no concept of how I could report and write about something momentous, a murder trial or a space shuttle explosion, in an afternoon. He also never understood how I could splurge on a diamond tennis bracelet but go to three stores to find the best price on mustard. He thought I sometimes expected too much of him, which perhaps I did. Still, we were in love. By the time he received his orders for Iraq in December 2004, we were finally ready to be a family. We decided to have you. At forty years old, I got pregnant in one passionate weekend when your father was on a break from training. Then, in the dusk of an early spring day nearly four months after he left for Iraq, I lay in a hospital bed giving birth to you, wracked by a pain so intense I did not think my body could endure it. I could not know that only six months later I would fall to the floor screaming from a pain more wrenching than childbirth, when I learned that your father had been killed. That night I reached for your journal, and I have read it a hundred times since. I find new insights every time. Your father had waited a long time for a son and wanted to be the kind of father you could admire. He had tried to be a good father to Christina, his daughter from a marriage that had ended in divorce, and it had always pained him that he didn't spend more time with her. To be a good father I think you have to be a good provider. That's not all. You should be a good communicator who has open views, accepts changing times. Be around for significant events. Be there to encourage you in whatever endeavors you desire. A good father always makes himself available. Excerpted from A Journal for Jordan by Dana Canedy, Pulitzer Prize-winner and senior editor for the New York Times Copyright © 2008 by Dana Canedy. Excerpted by permission of Crown, a division of Random House, Inc. All rights reserved. No part of this excerpt may be reproduced or reprinted without permission in writing from the publisher.